It's turning cold by product photos warm me up! Today I got another set of beautiful projects using our hardware from blogs, small businesses, and customers! To start, I've gotten a lot of nice photos from Cassie Bustamante before and these are up there with the best she's ever given me!! 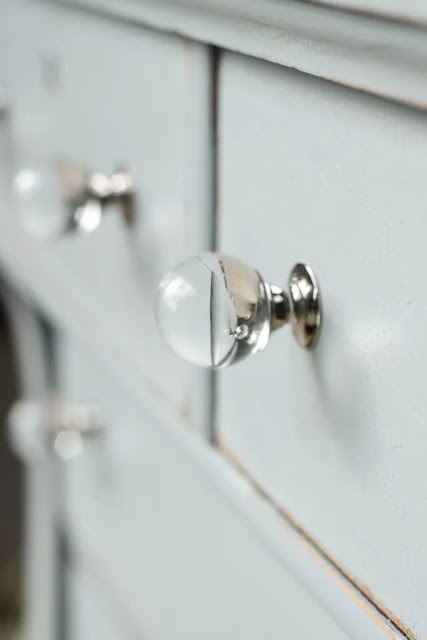 Click through to see the full post, but I couldn't help using the closeup of the round glass knobs in my article! Another long time contributor, Gail at My Repurposed Life, found some old porch posts being thrown out and turned them into this hall coat rack with some paint and D. Lawless Hardware hooks! 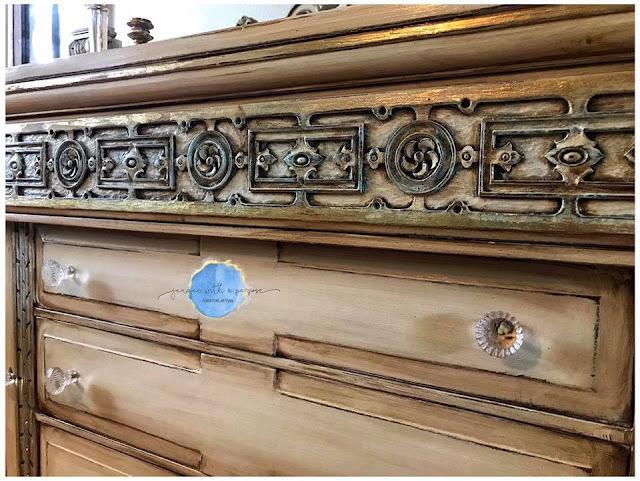 A recent new DLH Friends memeber, Michelle from Purposely Repurposed, used some of our brass bail pulls to restore this piece and give it an MCM look! 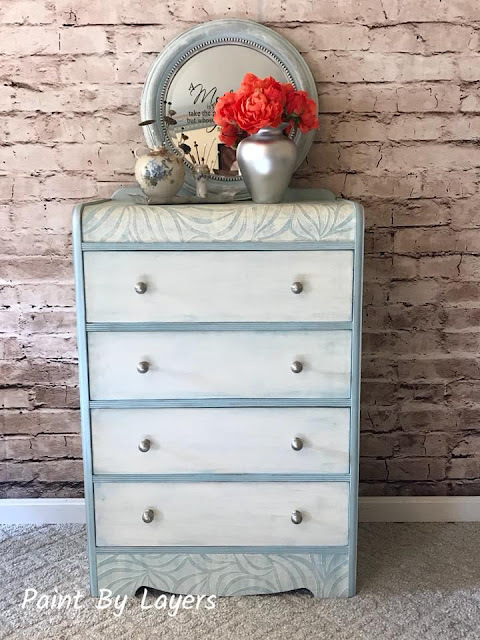 Another member of the DLH Friends group on Facebook brings us the lovely dresser or lingerie featuring our verdigris knobs and pulls! 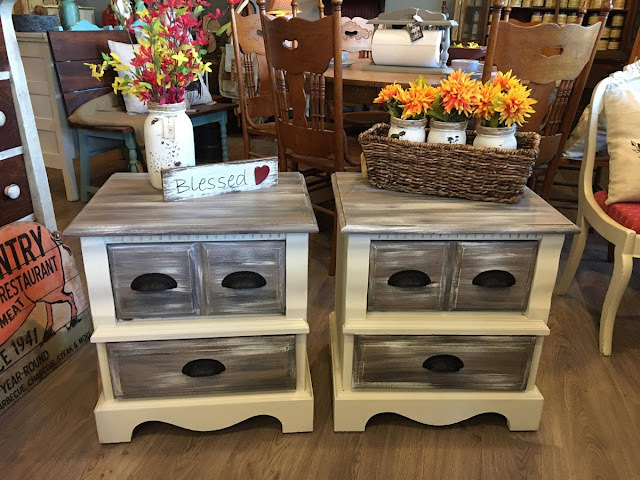 Donna does great work at ReFab-ulous Furniture! My Facebook group has been a huge boon to me as I get to work with all sorts of talented people and the product photos just keep rolling in! 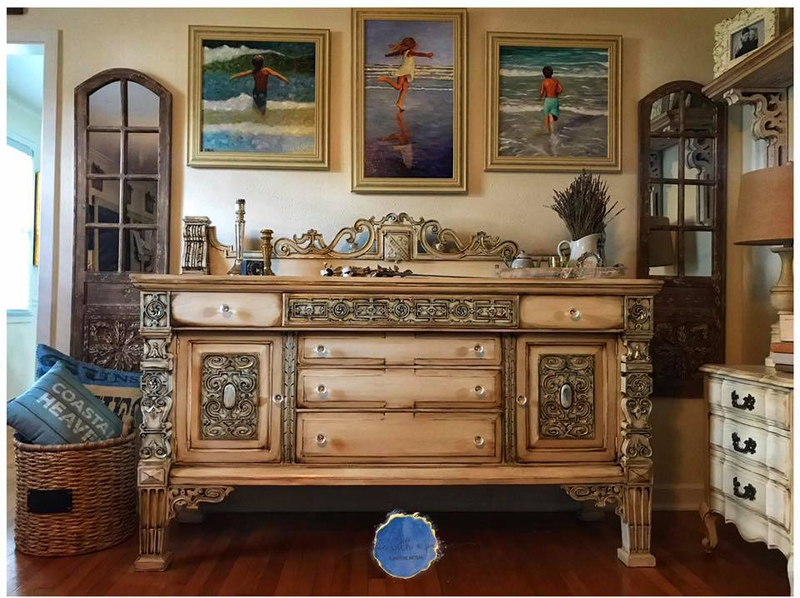 This nice wood stained dresser is from Danielle at Ferry Road Furnishings and uses a nice little Amerock knob for the hardware! I'd include more now, but I have to leave room for a post later this week! Haha, this post has nothing to do with sweet potato pie other than I just made one last night and it was delicious. I pretty much just ramble off whatever first comes to mind for these posts, haha! Just ignore me and look at the beautiful photos I got this past week! 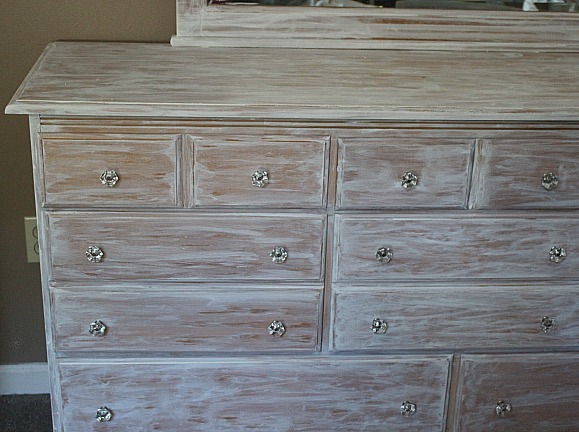 We'll start off with a lovely whitewashed dresser from Our Crafty Mom! Topped off with some knobs from our acrylic section. 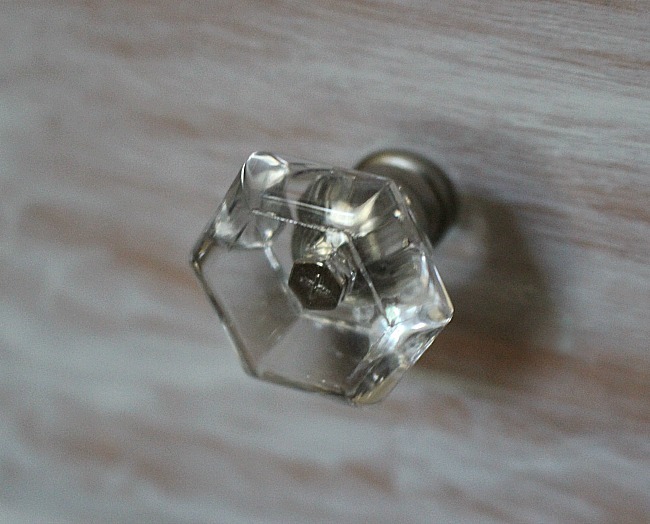 Acrylic knobs are perfect for giving the glass look at a fraction of the price. 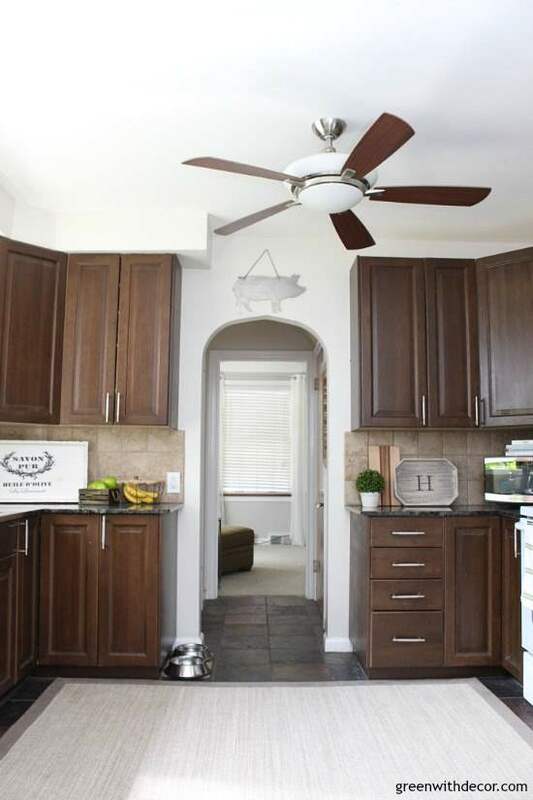 Next up is a beautiful kitchen renovation from Green with Decor! I love the earth tones of this kitchen and the stainless steel pulls go perfectly! The full post is great! Next up is Cassie Bustamante! Cassie was one of our first contributors to our website and really helped spur me on in my quest for endless photos of the products in use! 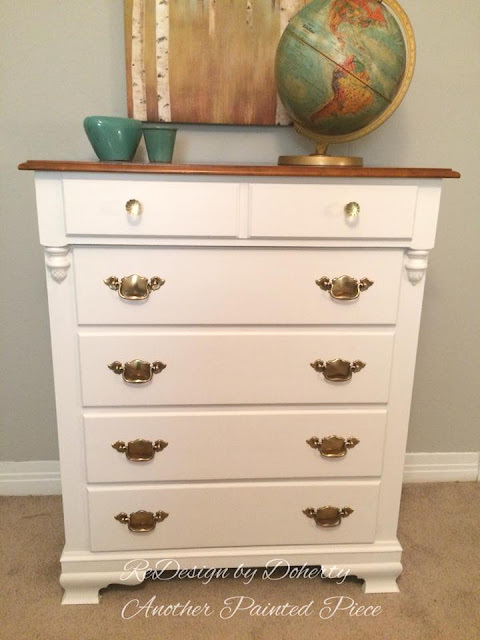 This nice little dresser uses our drop pulls and some matching knobs! 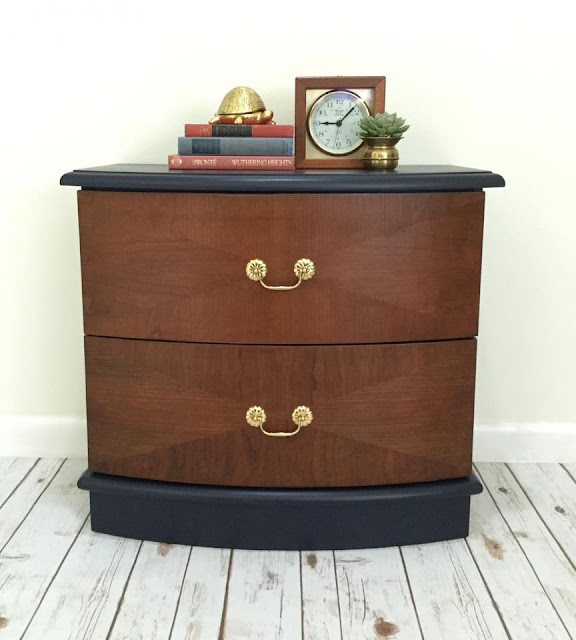 This next nice dresser is from Tommye Doherty of ReDesigned by Doherty. Tommye is a great customer and consistently gives us beautiful photos of our hardware on her latest projects! On this nice white dresser she used some of our glass knobs and bail pulls together. And lastly today I have a gorgeous black desk using some of our bail pulls, escutcheon, and keys from Melissa at Purposefully Repurposed! Melissa is another member of our DLH Friends group! Sometimes a post is so good I have to use it to feature entire collections and spread it's good vibes as far as I can. This post from Green with Decor is one of those posts. 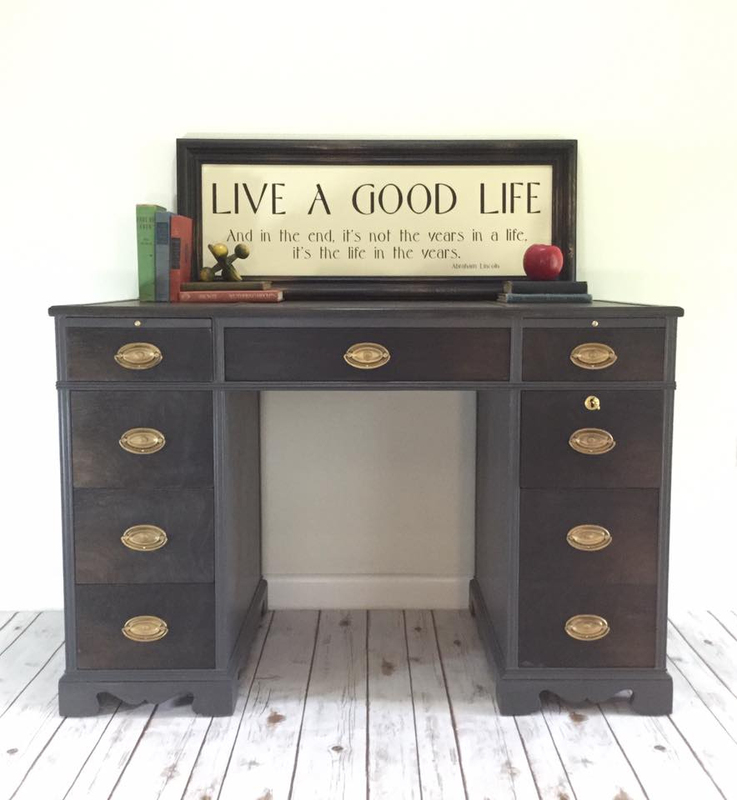 Meg used the Liberty ModernMetals bar pull collection to affordably update a kitchen. Many times a full renovation is too much work, too much time, or just too expensive. 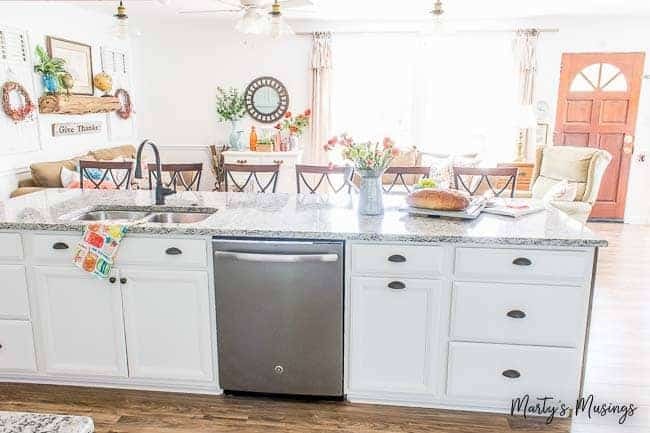 Her kitchen update post has seven great ideas for doing so and one of them is replacing the hardware. Meg used mostly the 128mm stainless steel pulls pictured below, but the full collection comes in lengths from 64mm all the way up to 288mm. That's 2" up to 12" for those that missed science class! LOL! You can see the full collection at the top of our stainless steel bar pulls page. Here's a close up, then I'll share a couple more photos and you'll have to jump over to Meg's blog to see the rest as well as the other nice tips she shares. I love the stained cabinet and the earth tone tile back splash and floor. The kitchen has a nice warm and natural feel. The pulls match perfectly and add just a touch of contrast to the cabinet and drawers. And one more shot of the pulls from the front. These pulls are very robust in the center and even the long ones look great vertically when used for pantry pulls or appliance pulls. Our website is looking better and better every day with the help of our customer and blog partners. We are a small business and these blogs are small business too remember! So please support their awesome work providing decorating tips and ideas by clicking through and checking out what else Green with Decor has to offer. Bail pulls offer a different look than standard straight line pulls and sometimes it's just what is needed. 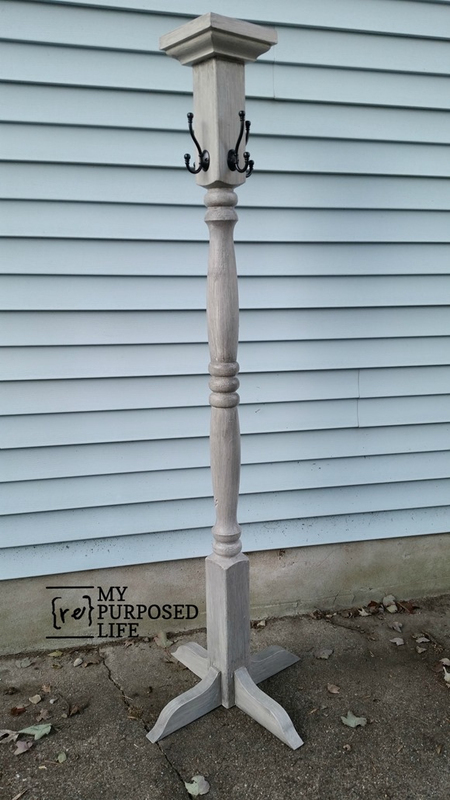 Whether it be that the piece is a little curvy or if the original piece used bail pulls and you want an authentic restoration, bail pulls can sometimes be the perfect fit. And it just so happens I've got several examples of just that! I was impelled to theme this post by all the great projects featuring our bail pulls over the past week and I'll start with the one that hands down got the most reaction. Maybe because of the gorgeous purple paint job? Or the staging with the skull? The whole piece from Bianca at Lotus Theory Design is wonderful. Bianca used these bail pulls but modified them for the piece which is something else I love to see! You can find more of her work on her Facebook page and website linked above. 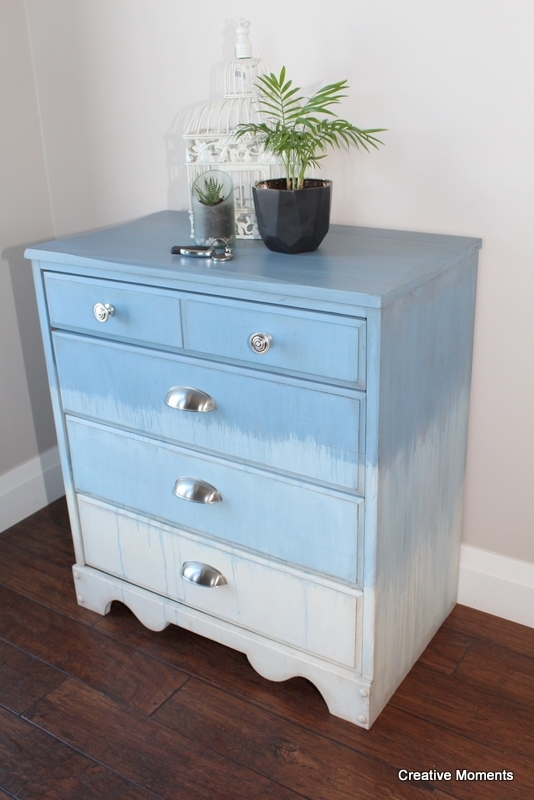 Next up is a project from Renee of The Painted Home. Renee used some of our solid brass restoration bail pulls on this nice dresser makeover. Perfect match with the paint job and her staging is beautiful as well. I can't believe I bumbled my way into working with such talented people. Not only are the projects beautiful, but the photography and staging are as well! 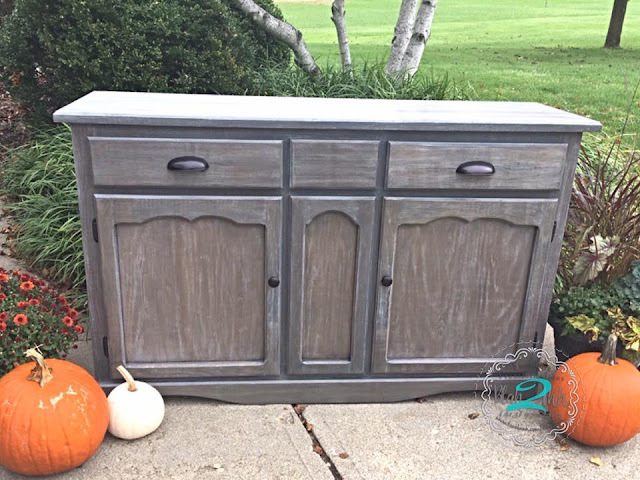 This post was meant to be as Melissa from Vintage Keiralie not only posted a picture to the DLH Friends group of her latest dresser makeover, but her post included bail pulls and some more great Halloween themed staging! Love it! I'm a big fan of magic and I hope this picture casts a spell on our readers! 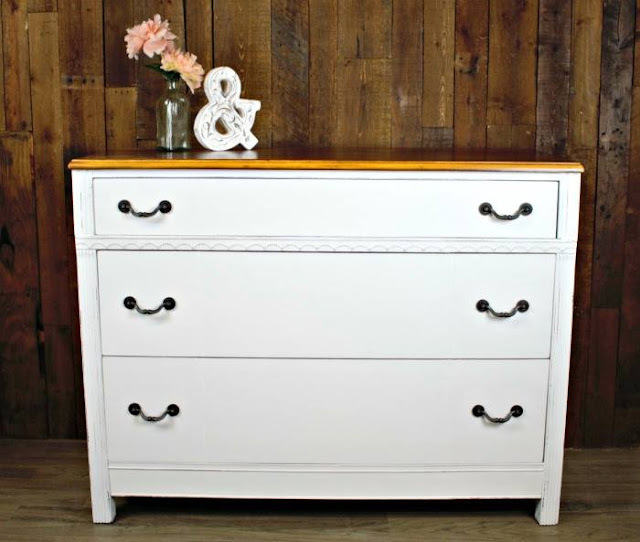 And last, but certainly not least is this white dresser makeover from long time customer and partner Roots & Wings Furniture. 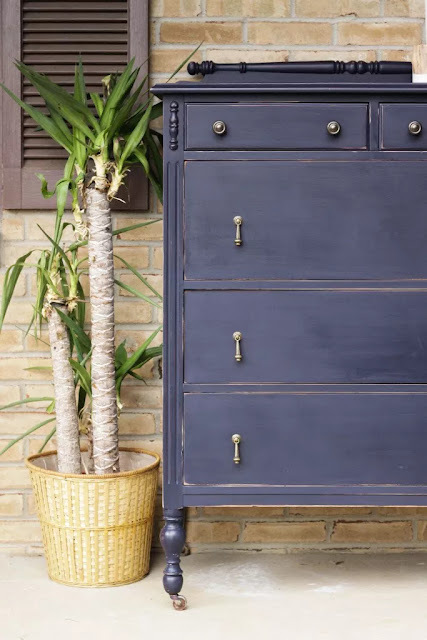 This dresser features what is called a "rigid bail pull" as it has the aesthetic of a bail pull, but it is not actually hinges and acts like a solid pull. 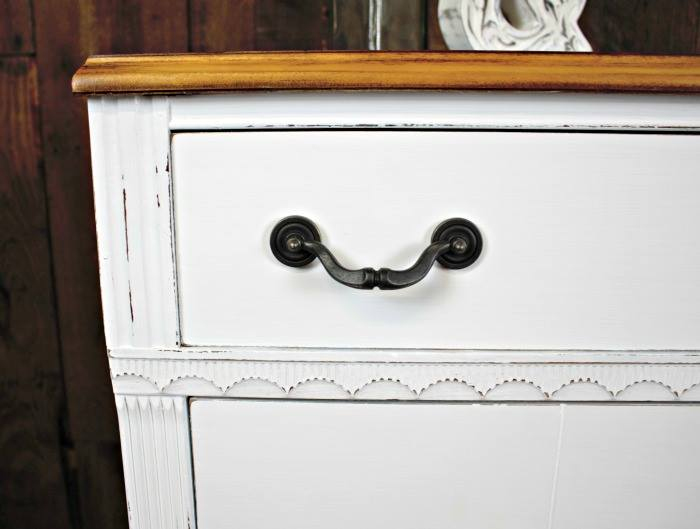 The bail pull is the perfect touch for this unassuming white dresser. Very nice! Until next time! Have a good weekend everyone! D. Lawless Friend Projects - Moon-Venus Conjunction Edition! Woke up today, took the dog out and saw the bright crescent moon rising with Venus bright and right beside it! A great way to start the day, I can feel the vibes already from the heavens above! Then I sit down at my computer and see all these wonderful project photos waiting for me and I know it will be a good day. Better than yesterday anyways when my water main burst and the basement flooded...lol. Anyways, without further ado I will start off with this amazingly intricate piece from Junque with a Purpose. Ryann used some of recently added India style glass knobs and used General Finishes products to makeover this beast of a dresser! The detail is awesome and it's an honor to have our hardware adorning this piece. Here's a closeup of the detail and our knobs together. Next up is a nice matching dresser set by one of my biggest contributors Tommye at ReDesign by Doherty. 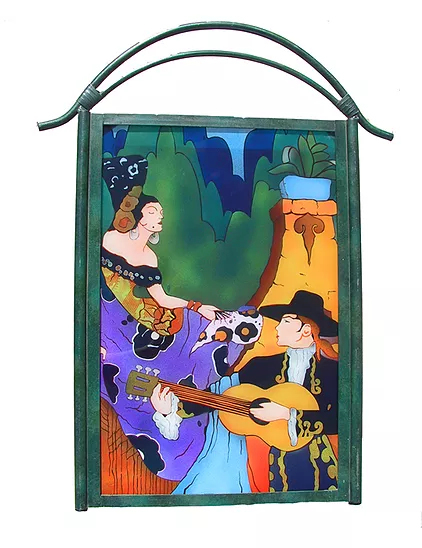 I still have no idea how Tommye consistently puts out so many nice pieces, I suspect she ahs a staff she doesn't tell anyone about! 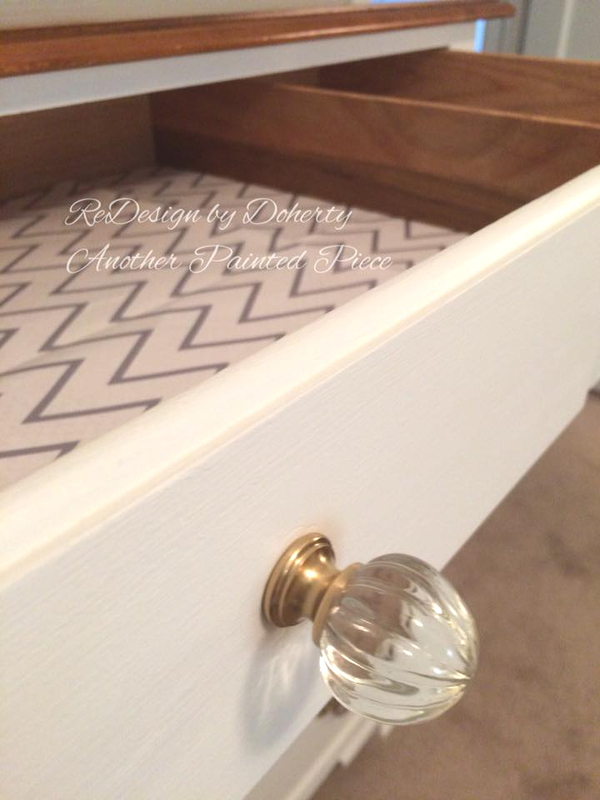 She used some heavy glass ball knobs on the top drawers and I believe it is the hardware from the original below. 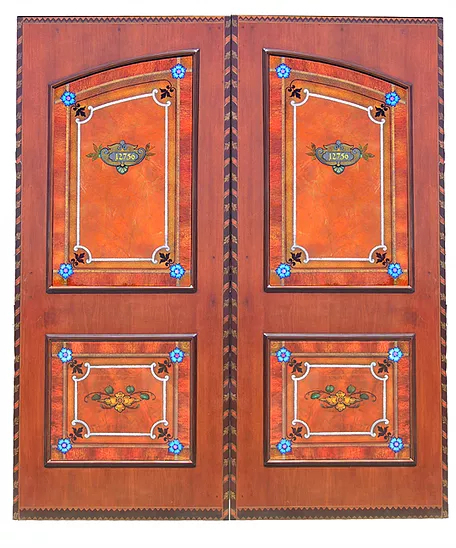 Over at Marty's Musings we had the pleasure of being featured in her post about how to choose the right cabinet hardware and it looks like she knows what she's talking about! 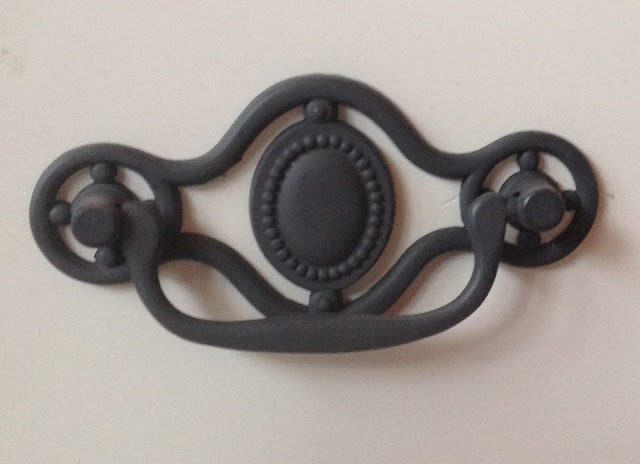 Marty used some matching antique pewter hardware on her kitchen makeover and the result is beautiful. I am a big fan of white cabinets as they contrast the hardware nicely. And here's a preview shot from Brepurposed of a kitchen we helped on with the hardware on. It's beautiful so I couldn't resist sharing now, but I'll share more it once it's fully finished up. Today I'm happy to show off our hardware as used in series of posts by Elizabeth of Elizabeth Burns Design. We've worked with her several times in the past and boy are we glad we did this time! Elizabeth did an amazing job flipping a small house that had a lot of potential and she used our hardware to coordinate throughout the house. We got included in three posts, so I'm showing off one photo from each and providing a link to click through to the rest. Our hardware is in the kitchen, bathroom, laundry room, and mud room! 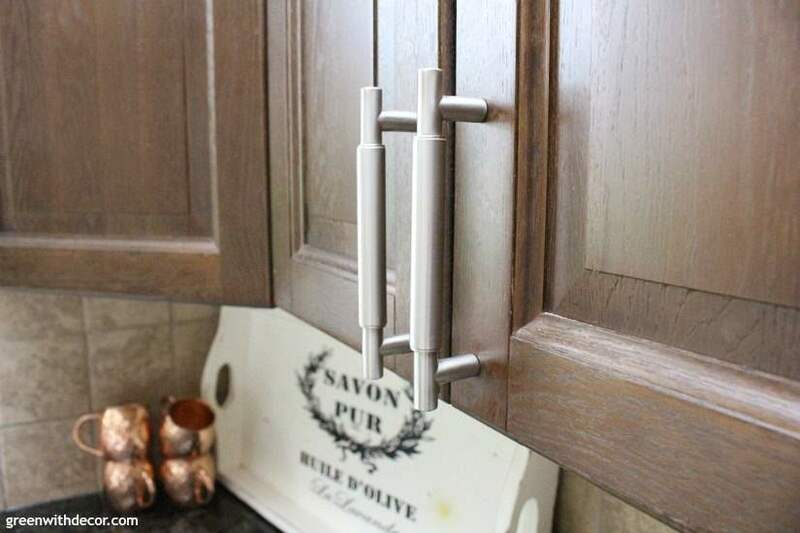 Elizabeth made great hardware choices in the kitchen pairing our mercury glass knobs, polished nickel pulls, and polished nickel latches. The mercury knobs look great paired with the polished nickel. 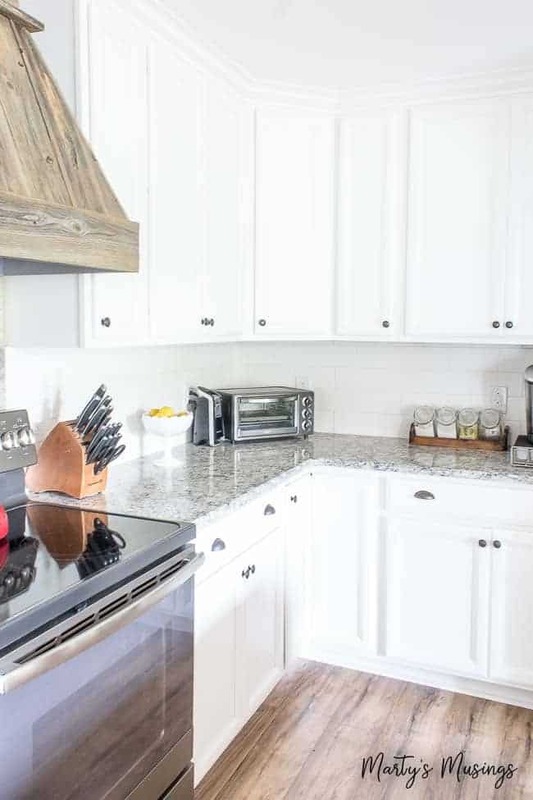 The full kitchen post shows all the befores and afters and is worth taking a look at! The whole house is done in beautiful grey and white tones. Here is a shot of the bathroom makeover using some of our our oil rubbed bronze hooks that are very popular. And finally a nice shot of the laundry room and mud room using the same hooks and hardware throughout! This house flip was a pleasure to show off and the photos I received are clearly of great quality! Be sure and click through to see the rest! And big thanks to Elizabeth Burns Design! DLH Customer & Partner Projects! Cup Pull Sandwich Edition! I got a lot of great photos from my friends online and customers in the last week. At this rate we are going to have the best site on the internet in a year! So...I usually try to theme them (weakly lol) so...the dumb theme that came to mind was CUP PULL SANDWICH EDITION! I've got two nice projects featuring appliques and knobs and they sandwich four awesome projects using our large cup pull selection! Please click through to the pages of our contributors, you won't be sorry they do amazing work! 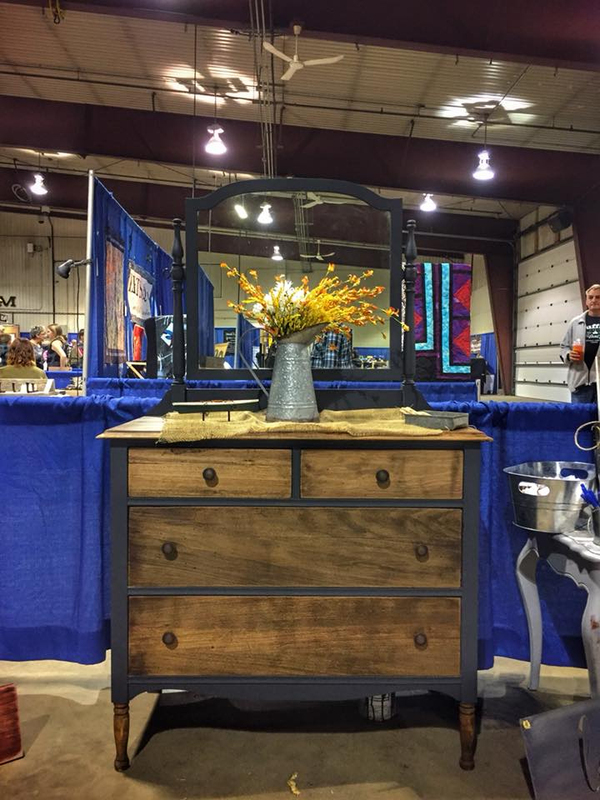 First up is this great vanity from Anne at Amini Designs Ashburn featuring a couple of our little plum appliques on the mirror! I love the hourglass design on the drawers! Next up is a lovely pair of matching nightstands from Donna of ReFab-ulous Furniture! She used some of our popular new Schrollwork cup pulls! This next one here is from Elizabeth Burns Design who I also just worked with on a wonderful house flip and I'll be showing those off later. Just some simple cup pulls and matching knobs on this fold top desk. Just today I got these nice shots from Blah to Ahh. 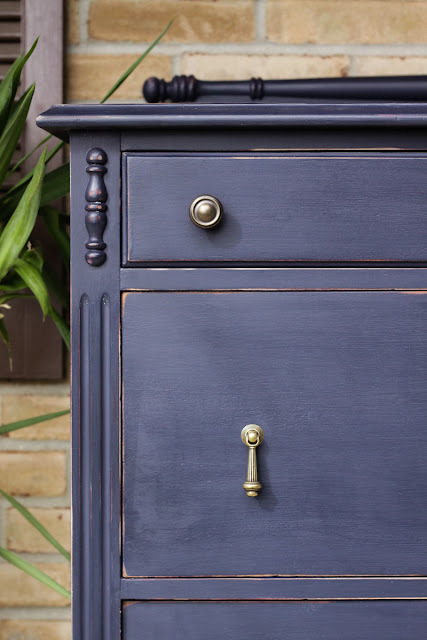 featuring matching cup pulls and knobs on this gorgeous cabinet makeover. 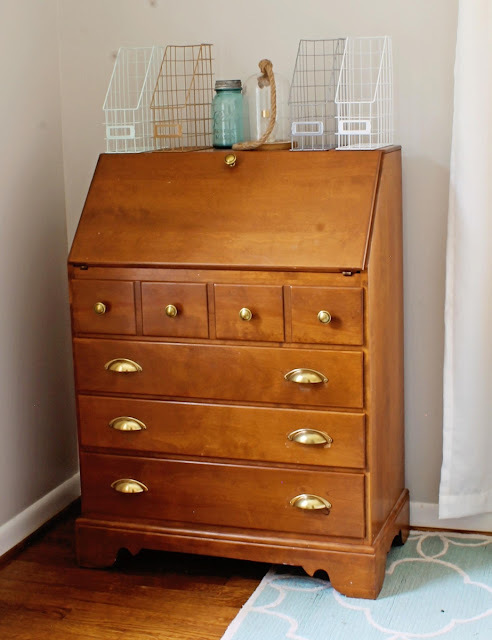 Click through to see the before (it was a junker!). 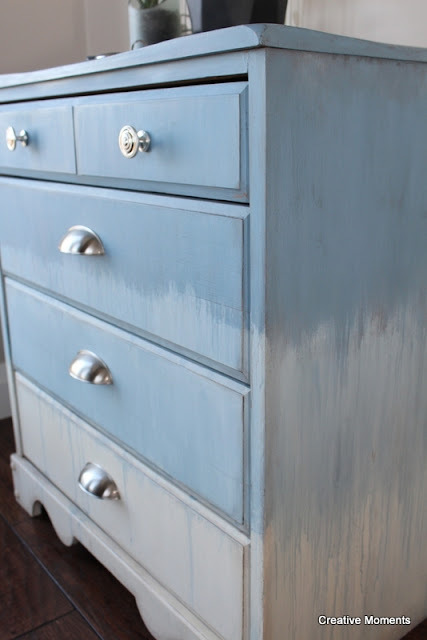 And last but not least is this waterfall dresser makeover from Teri of Paint by Layers! Teri found some simple Amerock satin nickel knobs and they are the perfect fit on this simple dresser. 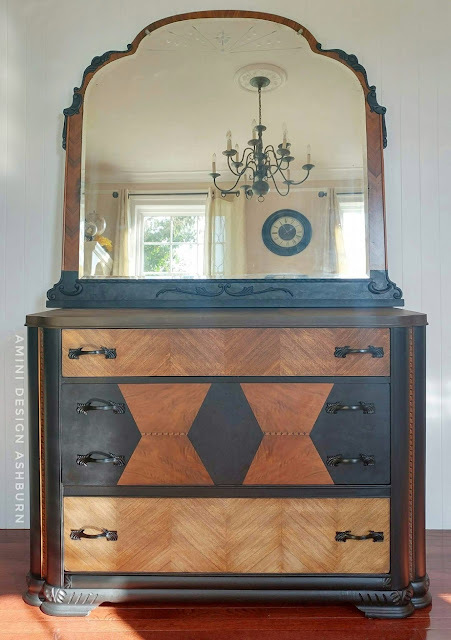 The top paint detail and staging with the mirror make for an awesome photo for our site! Couldn't be happier! I've got some more great projects built up, but I like to keep these posts limited so that everyone gets the proper exposure for their work! Thanks to everyone who sent in photos this week! We got a nice surprise in the mail recently and we wanted to share it with everyone as well as the small business that was kind enough to send in their work. 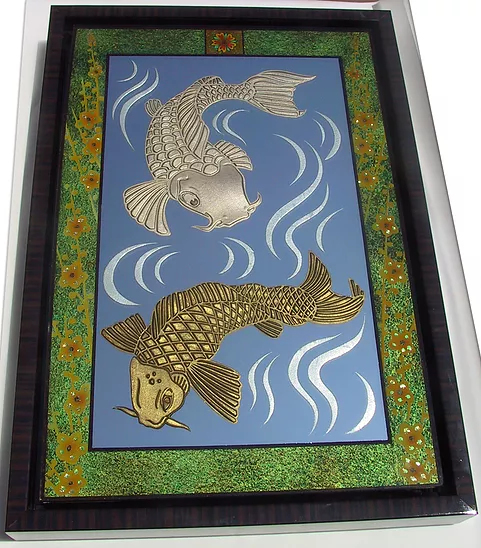 Swerdloff Designs out of California produces custom pieces using various mediums Most of their beautiful work involves the fusion of metal, wood, and glass. We love working with unique small businesses, so I'll share a bit from their about page which has more worth reading. 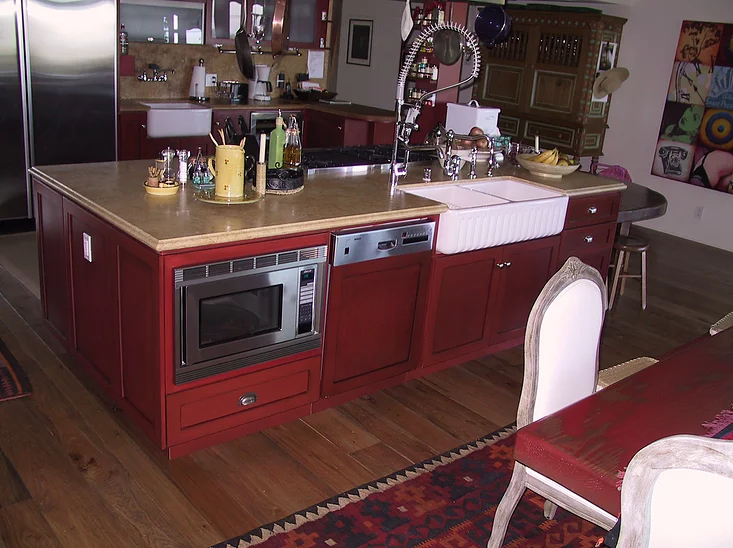 Allan Swerdloff has been designing, building and installing high-end kitchens, baths and built-in furniture since 1996. 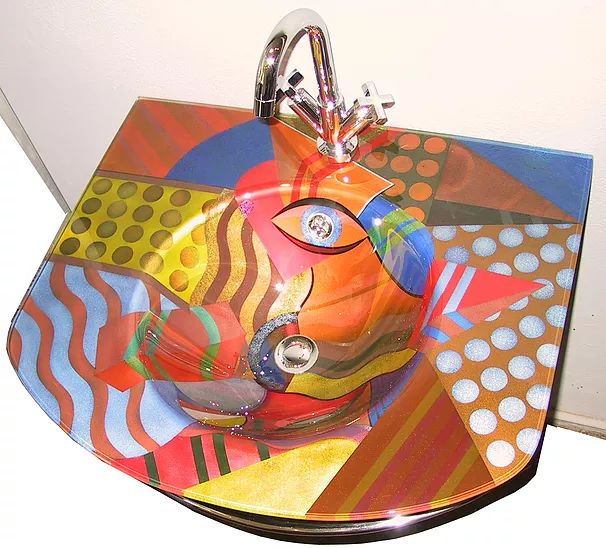 As owner of Allan Swerdloff Surface Design, he also designs and installs fantasy rooms and custom painted glass fixtures. Allan Swerdloff designs and work can currently be seen in venues such as the Beverly Hills Hotel, Sofitel Hotel, and Disneyland in Anaheim. He has worked with such up-scale Los Angeles area decorators as Phyllis Morris, Roberta Haas and Annette Rubin. His work has been featured in Awesome Interiors and Designing for the Sexes on HGTV. 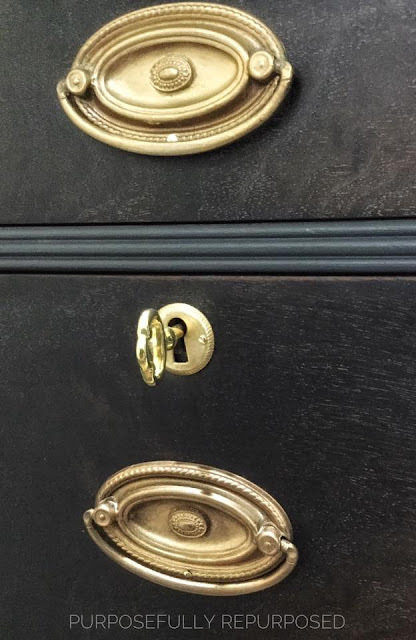 Allan was kind enough to send in this gorgeous set of knobs and pulls he created using our hardware making supplies. I think Allan may have found a new calling! Haha, although when you see the rest of his work below you won't be able to blame him if he doesn't move into hardware full time! This is nothing compared to the full house and venue work Swerdloff Designs does as their main business. Below I'll show off a few beautiful shots of their interior design work and custom glass work they've posted on their website. We greatly appreciate if you click over and take a look at Swerdloff Designs if only to see what kind of awesome interior design art is out there. You never know what you want til you see it!